GeoWoodstock, the premiere geocaching mega event, was held in St. Charles Missouri this year. 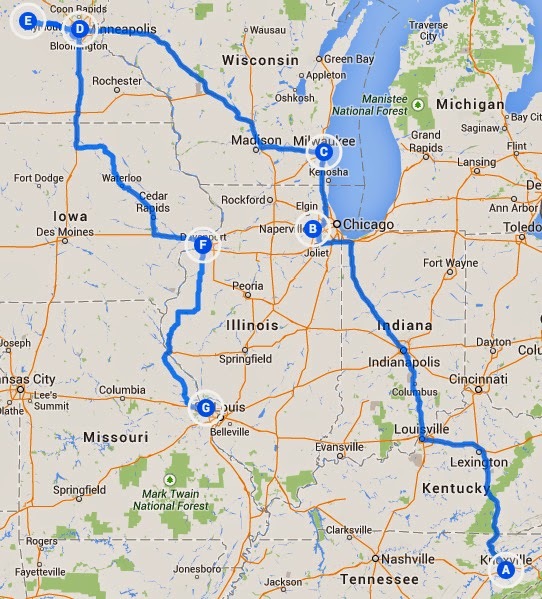 It is a single days drive, and a relatively straight drive path through Tennessee, Kentucky, and northern Illinois. Plan A is to make a long weekend out of it. That would be the simple and easiest choice, however we've already driven that route a few years ago, and wouldn't see anything new. So I came up with a more interesting Plan B: turn our one day drive to GeoWoodstock into a week long road trip! Along the way we would get to see some amazing sights, meet new friends, and see parts of America we have never seen before. This next series of posts will cover some of the more interesting things we got to see along the way. Since we took a long northern circular route from our home state of North Carolina, through Tennessee, Indiana, Illinois, Wisconsin, Minnesota, and Iowa to arrive in Missouri (see attached map), I decided to rename Plan B as the "Long Way Round". The first day and a half was pure driving through country we've seen before, so we didn't do much exploring. Just miles of interstate. (really just Plan A rearing its ugly head again). So, as a result, our first significant stop (covered in the next post) will be in the Chicagoland area, and will be of special interest to any Doctor Who fans in the audience (also any librarians). Stay tuned! This is going to be a fun ride.